In preparation for a three minute talk I gave today at a memorial event for Robin Murray, convened by his family, I have looked through email exchanges with myself, Pat Conaty, Laurie Gregory and colleagues in the co-operative sector, in his role as a very distinguished Associate of Co-operatives UK. There is so much more value of course than I did justice to on my feet, so here are some (edited, note) sayings of Robin over time that I draw out that strike me as timely and profound. At the heart of cooperation is sharing. If your identity is about possession, about having, sharing is a threat. If you are open to a wider sense of identity and value, that comes from sharing and collective being, it is an affirmation. Hence the great importance of the experience of cooperation, of festivals and dance, or common meals, of working together on a common task. I spent today being shown around Crumlin Gaol, by one of the people who’d been interned there, talking social innovation, peace and reconciliation. Talk about cooperation! The Prisoner’s Dilemma which is all about individualism is in some ways the opposite of what seems to characterise life there. I am struck by the emphasis needed on the spirit and temper of democrats rather than the pre-occupation with institutional structures. Democrats are not defined by institutions but by their relationships and being. Democracy depends on democrats just as cooperation depends on cooperators. The story of King Midas, and later versions (such as Volpone – “good morrow to the world. And next my gold. Open the shrine so I may see my saint”) are reactions to the expansion of commodity relations and the first transformation of money into capital. I’ve always felt uneasy about using the terms human capital, social capital and so on because it obscures the fact that money capital is ‘self-expanding value’ – it’s only raison d’etre is to expand. Human, social and indeed natural capital do not have this same impulsion. We risk losing ourselves in the infinity of monetary expansion to the exclusion of all else. Many of the most successful social ventures are centred on propositions that invert the norm. Slow food as against fast food. Peer lending between those without assets. Jaime Lerner’s Curitiba that paid for your waste rather than taxed you for collecting it. Care co-operatives that are about relationships rather than customer services. – those formed to create an alternative economy centred around some concept of the good life. It is striking how many sectors of the economy are dominated by a few large firms. Here is the bind. We depend on these companies yet they abuse their position. The Rochdale Pioneers came out of a counter movement in the 1840s. There was a surge of cooperation in the 1880s and 1890s in Europe in the wake of the long depression and of rural electricity coops in the US in the depression of the 1930s. Standing back, we see that just as there have been long waves of economic prosperity, so there have been long waves of cooperation. Early co-operatives in the nineteenth century developed separately from the state, and often in conflict with it. It was a social economic movement to provide basic needs for urban workers, rural communities and small farmers, based on mutuality and self-help. By the late C19 it had become what Lord Rosebury called ‘a state within a state’, jealous of its autonomy. But from 1945 onwards, it was undercut in many spheres by the expansion of the welfare state. Education, health, social insurance, housing, libraries, many leisure services became services provided by the state not by self-help. Slow to innovate, the UK cooperative movement entered fifty years of economic retrenchment. Now perhaps we are entering a third phase. Now we have a retrenchment of the state and a resurgence of the cooperative and social economy movement. One key innovation may be a model of public social partnership, which marries the advantage of cooperative, self-managed decentralisation with the public ‘systemation’ that provides coherence to the complex and diverse ecology of a digital age. Automation is coming but it does not dissolve the challenge of economic production. It does not solve the social design of technology and its control. It does not replace the growing need for relational services and human experiences. It does not solve the quest for the life affirming character of meaningful work. Attempting to build an alternative economics or politics without a connection to the practice of production, including virtual production of course, is like building it on sand. In or out for the UK, the future of Europe is being shaped right now, with the EU Council meeting on 15th of December to set a blueprint for the economy over the next ten years. This is the culmination of work kicked off by the EU President at the start of this year, in a consultation on the Future of Europe. As I pointed out, in a blog post for Cooperatives Europe, in September, the early founders of the EU in fact envisaged a far more democratic economy with co-operative enterprise and employee ownership throughout. That vision of Europe is still to fight for. To make an influence, we need co-operators and partners in the wider social economy to raise their voice. So I’d like to ask you to join our communications campaign through Thunderclap to show your support for a cooperative Europe that brings Europe closer to its citizens, values, a fairer society and the future. The more people sign up, the stronger the cooperative voice is, so please do consider whether you can sign up with your personal social media accounts, organisation accounts, and ask your colleagues to sign up as well. 1	click on this link: http://bit.ly/2zFjIeu. 2	click the ‘support with’ Facebook/Twitter button. 3	share it with your contacts. Cooperatives Europe will outline our own vision for a cooperative Future of Europe on December 11, for all the European institutions, inside and outside the European Union (EU) – the UK may leave the EU but we are still a European nation, open to a #CloserEurope through #coops. We have had a welcome set of visitors, from the co-operative sector in Japan in recent weeks. The Japan Co-operative General Research Institute (JC-Soken) coordinated a powerful delegation of co-operative leaders, from a diverse range of the country’s wonderful range of co-ops – from insurers to worker co-ops. Kenki Maeda, from JC-Soken, briefed me at the outset on the state of the Japanese sector. Having been writing on the history of the co-operative movement, I was delighted to find that Japan too, as with many other countries, had forerunners of the modern co-operative movement. Sontoku NINOMIYA was born in 1787 and was an administrator, innovator and philosopher. He saw agriculture as a communal venture, where surpluses could be put to communal benefit, extending farming land, saved for reserves or shared when required. Credit was key, but it needed to be affordable. His lead helped to spread of mutual organisations called “Hotokusha” across communities. In the twentieth century, co-operative laws helped to establish and underpin the growth of a wide range of co-operatives, including agriculture, fisheries, consumer retail, health, insurance, credit unions and forestry. In agriculture, for example, JA-ZENCHU operates as the Central Union of Agricultural Co-operatives, with around 660 primary co-ops in the sector. In the consumer co-operative sector, JCCU (Japanese Consumers’ Cooperative Union) estimate that there are 558 primary co-operatives, with a combined membership of 28.7 million people. In the insurance sector, the Japan Co-operative Insurance Association estimates that there are over 2,600 co-operatives, covering 75.38 million members. While having specific laws with their own focus and link into government and local communities, one unintended consequence has been the lack of a joined up and integrated framework for co-operatives as a whole. Worker co-ops for example lack their own law, while few co-operative leaders are convinced that the current, or new, government of Prime Minister Abe is sympathetic to Japan’s co-operative traditions. Business governance is high on the political agenda, with a Corporate Governance Code and Stewardship Code introduced since 2013, but this is conventional corporate governance rather than the member-owned or community-oriented model of co-operatives. The Japanese associations of co-operatives are therefore exploring how to work together more effectively, trying to reorganize the existing Japan Joint Committee of Co-operatives (JJC) and to create a stronger cross-sectoral organization with more human and other resources. It was under these auspices that the Co-operative College in the UK hosted a distinguished delegation of senior co-operators – keen to learn what works and what doesn’t work so well here in the UK. Education and research of cooperatives (gathering, sharing and disseminating information, such as cooperatives’ good practices). It is inspiring to have this dialogue and contact across nations. Each has its own deep historical roots and identity. Each has shared challenges and things to learn. To be a pirate is to set yourself against society and its rules. To even the odds, pirates come together. They co-operate. It might sound like an extreme claim, but there is a body of evidence of early mutuality and even democracy among some of the most successful seventeenth century Caribbean and Atlantic pirates. Bartholomew Roberts, Welsh born, was the most renowned pirate of his day. By the time he died, in February 1722, resplendent on deck in his crimson waistcoat, struck by Royal Navy grapeshot, he and his crews had captured around four hundred vessels. His approach to organising, giving every pirate a say and a share, was described by Captain Charles Johnson two years later in his A General History of the Robberies and Murders of the most notorious Pyrates. Drawing on my new short book – free to download – which is a retelling of the history of co-operation and mutuality, I have expanded on this, in an article about Pirates, Mutiny and Mutuality on Huffington Post. Pirate co-ops… is this a tradition we will draw on again? We are launching now a fresh re-telling of the story of co-operation, in a short book which tracks early cases of mutuality around the world. 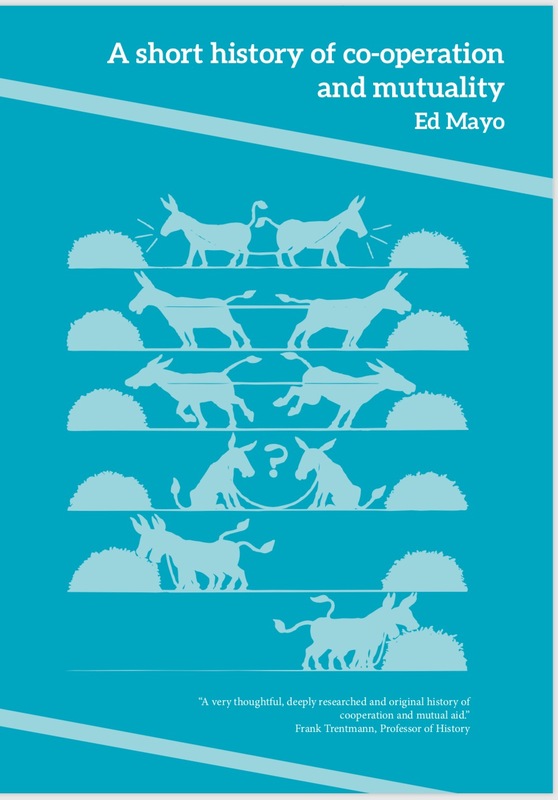 The book, available free to download and in English and Spanish editions, is called A Short History of Co-operation and Mutuality. Drawing on this, I have also put together a slide deck of twelve early co-ops, with design support from colleagues at Co-op News. One of the examples, that came to me courtesy of colleagues in France, Coop FR and the international social economy journal RECMA, is the case of cheese. In rural Switzerland and the Franche-Comté region of France, cheese-making societies, termed Fruitière (ripening) started in the fourteenth century, then spreading to other European countries. From informal reciprocity, exchanging milk between neighbours, these developed into full mutual societies. Each round typically lasted for a year, starting in February with the first milk coming in March or April. The accounting system was in urns of milk – the farmer that took the cheese was then debtor to others who had contributed milk – and the product, and dividend from its sale, was the cheese. In these mountainous areas, it is possible to trace the lines of mutuality from these neighbourhood associations, present in different forms and with different functions across medieval Europe, through the development of self-governing quality standards and charters, such as the Appellations d’Origine Protégée, to the co-operatives that are responsible for the production of Comté and Gruyère cheese today. There are many more stories in the book. Thanks to the International Co-operative Alliance, around two thousand delegates coming to Malaysia from around the world will get a copy. My hope is that we learn more about and take confidence from the enduring way in which different cultures and different generations have harnessed co-operation as a way to live and work together. What if it is co-operating and not competing that’s key to getting ahead? Business, careers, even education… we are increasingly told that to get on is to get ahead, to compete. But what if it wasn’t competing with others that powers success in business and in life, but co-operating with them? Co-operation in the economy is not often talked about, but it has always been there. The first powered flight took place in December 1903 by the Wright Brothers. What followed was then a bitter rivalry for the next fifteen years between them and a rival airplane maker, Glenn Curtis. Come America’s entry into the First World War and no American airplane was viewed as good enough to go into combat. The Wright brothers and Glenn Curtis were willing to see the airplane industry grounded than to see the other win out in terms of setting standards for airplanes to succeed. In 1917 US Congress forced the formation of the Manufacturers Aircraft Association. This was a way to set shared standards and pool the critical patents needed for airplanes and the aeroplane industry to take off. The same idea of a patent pool is used today to cut the costs of HIV retroviral drugs in Africa. Sometimes you have to co-operate, to get ahead.